Dr. Bruce Douglas and former Chicago Chapter board member, Dr. Linda Gruber, who currently resides in Arizona. By Mary Mares-Awe—THIS YEAR. THE WORLD MARKS the 70th Anniversary of the End of World War II. The American forces who liberated the world from the Nazi/fascist terror are part of what’s known as “The Greatest Generation”. A generation that distinguished itself with bravery, sacrifice and a sense of duty to make the world a safer place for the next generations. For that, we owe them our gratitude. Today, the concept of a safe world is especially poignant as new forms of terror are rearing their evil heads in many parts of the world. We are reminded of just how grateful we should all be, to the allied soldiers who destroyed an evil 70 years ago, so that we can now live free. I’m proud to know a member of the “Greatest Generation,” and he is one of us –a Fulbrighter. His name is Dr. Bruce Douglas and he has a long list of honors next to his name. He served in the Pacific Theater with the US Navy, and was stationed in Japan and Korea for several years. He received his undergraduate education at Princeton, where he was impressed with the University’s motto, “in the nation’s (later changed to the “world’s) service”; he received a dental degree from New York University and his postgraduate training in oral and maxillofacial surgery at Columbia University. Dr. Douglas returned to Japan as a Fulbright professor, where he taught innovative techniques in oral surgery to Japanese students and doctors at Okayama University, from 1959 to 1961. He learned Japanese and became a part of the local community, renting a typical Japanese house. His wife gave birth to their second son, who was the biggest baby ever born at Okayama University Hospital. Japanese was their first son’s initial language. The Douglas family’s community role led local leaders to request a renewal of his Fulbright grant, and Bruce was granted an unprecedented second Fulbright year as a result. Bruce’s outlook on the world matured when, as a teenager, he spent three summers at a scholarship summer camp in upstate New York where, as he says, “I met kids from all over the world,” as well as boys from outside his confined Brooklyn neighborhood. “That was the start of my international experience,” which ultimately led to his Fulbright years in Japan. “I knew then, that I was going to do things that were international in nature,” he adds. 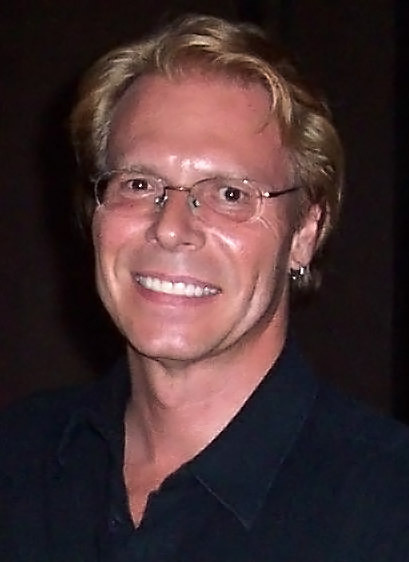 Bruce’s interest in education, led him to Columbia University Teachers College, where he received a Master’s degree and a Professional Diploma in Higher Education. Bruce says the highlights of his studies at Columbia were courses with the world-renowned anthropologist Margaret Mead and Donald Tewksbury, Professor of International Education. Dr. Bruce Douglas and Hon. Consul General of Japan, Toshiyuki Iwado discussing education issues during a recent reception at the consul’s residence. His introduction to Fulbright came from a Japanese Fulbright professor, whom he had met earlier while serving in the Navy in Japan, who asked him to come to Japan to teach and conduct research. Today Bruce still keeps up with his contacts in Japan, and he is a personal friend of the Japanese Consul General in Chicago. After his Fellowship, Bruce spent a year at the University of California acquiring a Master’s degree in Public Health, which ultimately became the foundation for all his future professional activities. He moved with his family to Chicago where he became Professor of Oral Medicine at the UIC College of Dentistry and Professor of Preventive Medicine at the College of Medicine. He also began a long part-time career as an oral surgeon in Chicago’s and, later, Waukegan’s lower-income neighborhoods. 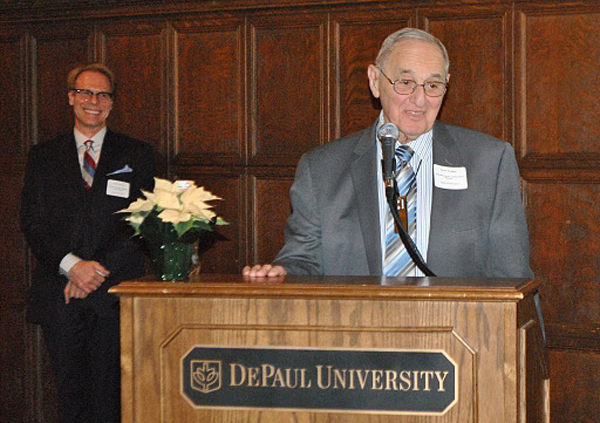 Dr. Douglas and his wife Jan at the 2013 Fulbright Chicago Holidays Reception, where Dr. Douglas received the Pioneer Award. With them, Dr. Ron Harvey. 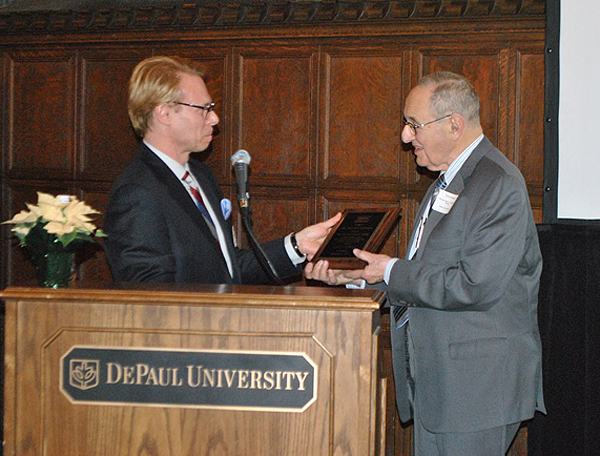 He continued his Fulbright legacy, becoming co-founder of the Fulbright Association’s Chicago Chapter, and its first president. He was also a Fulbright “ambassador” to the Soviet Union and Russia in 1990, 1992 and 1995. In the ’70s he served as an elected member of the Illinois House of Representatives and was instrumental in encouraging the State of Illinois to invest in a School of Public Health at UIC, of which he was the first faculty member. As a legislator, he introduced and passed many pieces of legislation, most notably in the fields of public health and education; but the two for which he is best known were the right-turn-on-red law and the start of the Illinois lottery, in the “mistaken expectation” he adds, that its profits would all go into public education. In July of this year, Bruce celebrated his 90th birthday. He was invited to return to the UIC School of Public Health in October of 2014, to which he commutes three days a week as Professor of Health and Aging; and he has also been reappointed Professor of Oral Medicine at the College of Dentistry. He has recently published a compendium of his work on the subject of “the older worker,” which is a field in which he has published and lectured widely. I had the privilege to interview Bruce about his Fulbright and life experiences at his North Shore home, where I also met his lovely wife and their little grandson Joey —Bruce’s pride and joy. Bruce met Jan, his second wife, in Thailand where they were both serving as WHO consultants. Jan is the Human Resource Director of Refugee One, a major Chicago organization that settles refugees from some of the most deprived places on earth. Their first child, Sarah, works with the UN Women’s Peace and Security Division, in a high ranking managerial position. Another daughter, Sandy, whom they adopted when she was four, from Colombia, where Bruce had served as a WHO consultant, also works for Refugee One. The content of the interview goes well beyond the scope of this blog post, but I wanted to share portions of it with you, so that you too can get to know one of the most distinguished and inspirational members of our Chicago Chapter, and someone we all should know. By Mary Mares-Awe and Elio Leturia—DURING THE 2013 FULBRIGHT HOLIDAYS Celebration that took place on December 2 at DePaul University, Dr. Bruce Douglas was honored with the Fulbright Chicago Pioneer Award for his devotion to the Fulbright mission and his contributions to establish the Chicago Chapter of the Fulbright Association in 1990, when he became its first president. Dr. Douglas was a Fulbrighter to Japan in two successive Fulbright professorships, in 1959-1960 (Okayama) and 1960-1961 (Tokyo.) He was also a Fulbright “ambassador” to the Soviet Union and Russia in 1990, 1992 and 1995, working with Sherman Funk, Inspector General, U. S. State Department. Dr. Douglas thanking the association for this lifetime award recognition. In one of his international experiences, Douglas met his wife, Janet Douglas, when they both worked in Vietnam and Laos. He also had a brief stint in Cambodia. Janet’s English background led them back to the UK in 1977, where, supported by WHO and with Jan’s help, Douglas studied The British National Health Service, and became imbued with the benefits of a national health system, an idea to which he remains wedded to this day. During his Fulbright presidency, Douglas and his wife hosted Senator J. William Fulbright in Chicago. Dr. Douglas and the Hon. Yoshida Masaharu, Consul General of Japan. Dr. Douglas, 88, delivered a heartfelt speech upon receiving the award. He has had a long distinguished career as a surgeon and researcher. Board President Ron Harvey presented him with this important recognition. 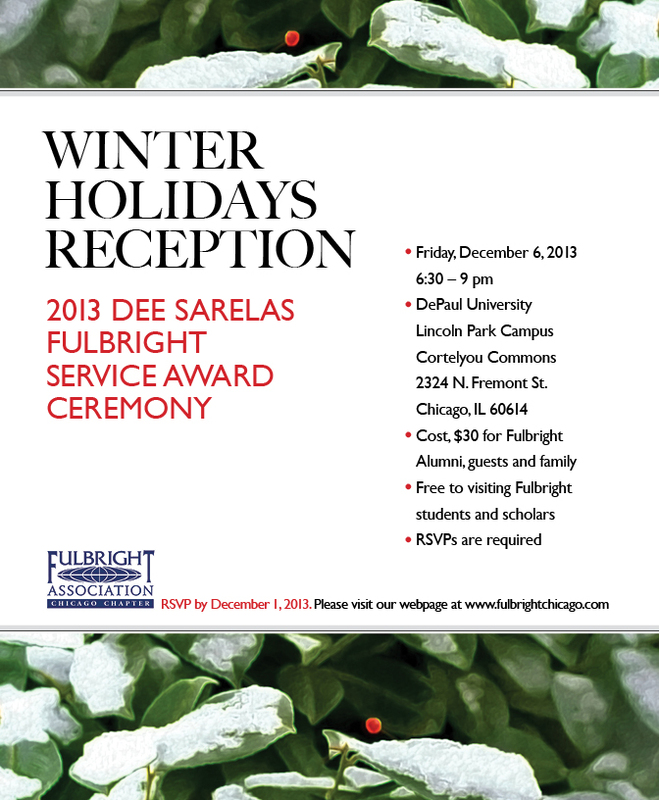 By Ron Harvey—THE FULBRIGHT ASSOCIATION Chicago Chapter, the Institute of International Education (IIE), and DePaul University invite you, your family, colleagues, and friends to attend our end-of-year Winter Holidays Reception and 2013 Dee Sarelas* Fulbright Service Award Ceremony. TIME 6:30 to 9 p.m.
Cortelyou Commons is accessible from the sidewalk from Fullerton or Belden Aves. A full buffet-style dinner will be served which includes salads, entrees with vegetarian options, soft drinks, coffee, tea, and desserts. Beer and wine are available at a cash bar. Entertainment will be provided. COST This event is FREE for current visiting Fulbright Students and Scholars. $30 for Alumni, each adult family member, and/or guest(s). You may pay at the reception using cash or check. We also accept credit card at the reception or online via PayPal plus a $2 credit card fee. You may pay though PayPal payments after you RSVP using the form below. PARKING is available at the DePaul Sheffield parking garage just west of Cortelyou Commons. Attendees are responsible for their own transport and parking. The CTA Fullerton Red/Brown/Purple Line stop is one block west of Cortelyou Commons. See www.transitchicago.com to plan your trip. * The Dee Sarelas Fulbright Service Award is named after a founder of the Fulbright Association Chicago Chapter: Aphrodite (“Dee”) Edith Floros Sarelas, an early Fulbrighter to Greece. A Chicagoan dedicated to interacting with and nurturing Fulbrighters in the Chicago area community, Dee is remembered for her wit, empathy, and vivacity in bringing people across cultures together. The Dee Sarelas Fulbright Service Award has been established in her memory. 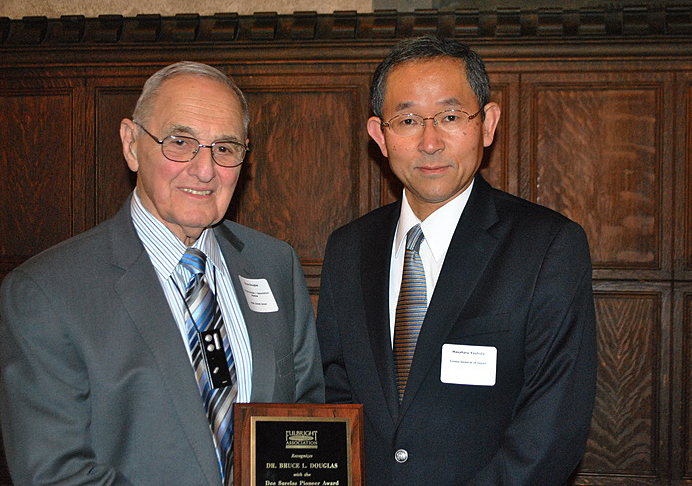 We honor a local person for their outstanding work promoting the vision of Senator Fulbright. Please join us in honoring Dee and the Fulbright legacy. We look forward to seeing you at our 2013 Winter Holidays Reception! AFTER SERVING AS the Chapter’s Secretary for the past two years, Ronald Harvey was recently elected President of the Chicago Chapter of the Fulbright Association, succeeding Elio Leturia. Ronald Harvey, MA, who did his Fulbright in Bulgaria in 2009-2010, is a PhD candidate in Community Psychology at DePaul University. He is also a Project Director of a multi-year NIH-funded research project investigating alternative aftercare settings in the U.S. for ex-offenders with a history of substance abuse. His area of expertise is substance abuse aftercare settings and community re-integration of recovery communities in the United States, Eastern Europe, the U.K., and Kenya. While abroad on his Fulbright he conducted a needs assessment and feasibility study for creating recovery homes in Bulgaria. Ron has authored or co-authored of a number of peer-reviewed journal articles and presentations at psychology conferences in the U.S. and Europe. Prior to pursuing is PhD, Ronald had an 18-year professional career beginning as a software developer, and 10 years as an IT manager at a global investment bank. Ron is a graduate of the Second City Improvisation Program in 2012. His hobbies and interests include playing guitar, reading, classical music and ballet, attending theater, and observational astronomy.